Last night we spent the evening with my cousin, my wife’s favorite person, and her boyfriend and a couple other friends of hers. We ate good food and played Cards Against Humanity. Amazing time with amazing people! Back to the happy memories. The hotel we stayed at was across from an Old Chicago. If you have not tried this restaraunt, you need to!! Amazing pizza and the spinach artichoke dip is to die for!! It comes with bread, fried tortilla chips and veggies! Yum! After that we had pineapple and ham pizza, most people call it Hawaiian. Amazing and totally different from anything I have eaten before. After that we went to my cousins for a few hours. When we got back from there I went off to karaoke for the last hour and my wife went to sleep. I came back after singing a duet with a friend I hadn’t seen in 6 years! I wish I could share it here. Oh, I can! Check it out Here!!! Then today we met my sister at an amazing eatery in Eagan called The Mason Jar. 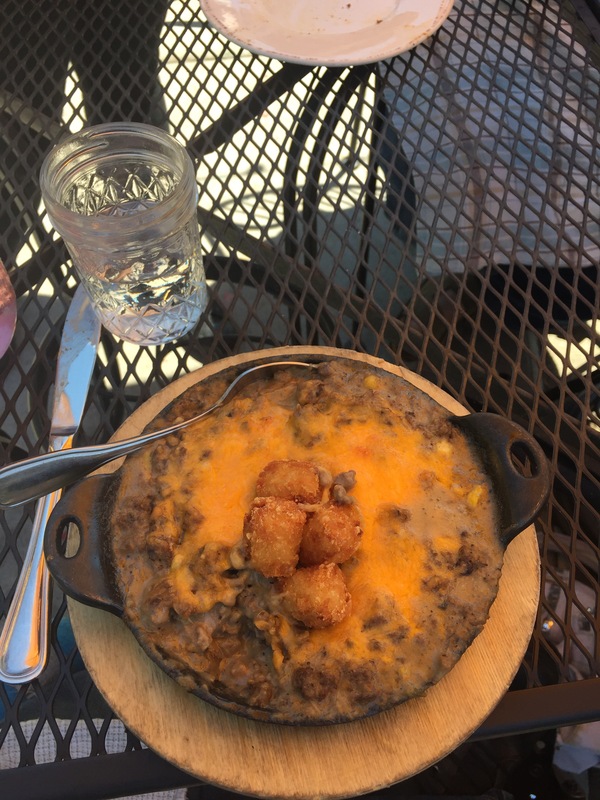 I had tator tot hotdish. Yum!! I would recommend this place to anyone!! If you are familiar with the southern metro, it’s in Eagan on Cliff Road. Then we had adventures in Target!! My sister brought a friend who I have a lot in common with and we totally bonded today! It was an amazing time! Tomorrow we are going fishing again with the neighbors!! I will blog about that too! See you all tomorrow! Sorry. We won’t be there again tomorrow, no. What fun! A very cheery post! There’s a lot more where that came from. Feel free to look around at all my posts if you would like. I like to keep my blog upbeat and full of deep thoughts. Yes. I have had somewhere in the area of 40 surgeries. All surgery is risky, but it’s always a last resort. It’s always necessary when it becomes the option.